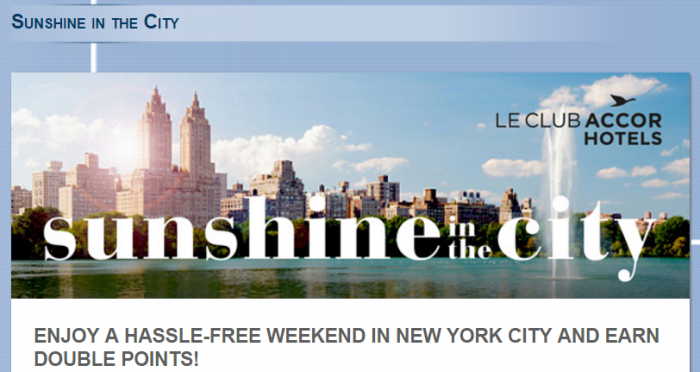 Le Club AccorHotels had launched a double points promotion to promo Novotel & Sofitel hotels in the New York city. Members must book and stay on Sunshine in the City-offer between May 13 – August 31, 2016, to take advantage of this promo. Just mare sure if you are planning to take advantage of this offer that the rate plan is not inflated. I personally prefer the bonus points offers that are not tied to the booked rate. 1. General Le Club AccorHotels terms and conditions apply to the Sunshine in the City offer and you must be Le Club AccorHotels member to benefit from it. 3. This offer is valid for a member’s stay from 13/05/2016 to 31/08/2016 in one of the participating hotels in New YorkCity (0743, 2581), and booked between 13/05/2016 and 31/08/2016. 4. The stay must be a minimum of 2 night(s) including any nights between Thursday and Sunday. 5. Any consecutive stays (check-out and check-in same day) in the same hotel, will be considered as a single stay. This single stay will be eligible once to the Sunshine in the Cityoffer. The stay must be booked at theSCNY rate. If this rate is not available, the member cannot benefit from the offer. Previous articleReader Question: IHG Rewards Club Share Forever & Accelerate Overlapping Promotions Combinable?